My hand is raised! Lol. Raising my hand as well. Nice to know that Lerner is still around, as I was always fond of that chain. For some reason, they had the nicest display mannequins. Ooohh, hell yea! 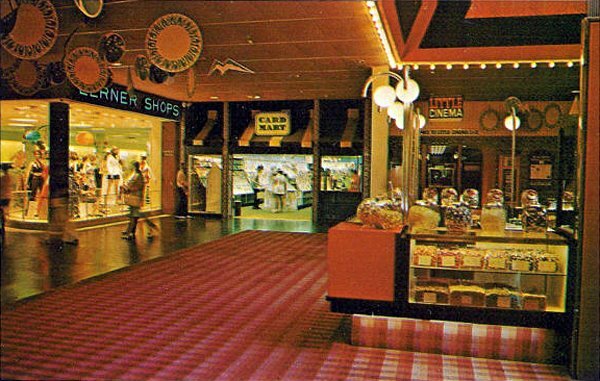 I sure digs me some 70s gaudy malls and its interiors! That looks like the Sears wing to me...I am pretty sure that Lerner (now NY & Co) is still in the same location after all those years. Great pics of Willowbrook...brings back a lot of memories. I love seeing these Willobrook pictures! My boyfriend and I spend many a weekend there and it's nice to see that Lerner (NY & Co.) and the card shop (now a Hallmark) are stil there. There's also a nice flagstone wall near the Sears entrance (which is near NY & Co.) that has probably been there since the dawn of Willowbrook. oh man - its even got carpet! I worked for Prudential Ins. Co. in Wayne (Willowbrook branch)in the late 1970's and every Friday we would get pizza there and go shopping-Ohrbach's was my favorite store back then-I could actually afford clothes there...incidentally, most of Lucille Ball's wardrobe was courtesy of Ohrbach's!! Here's one for you. I could swear that here was at one time an elevator in between two of the unrelated small stores in the Stern's (now Bloomingdale's) wing but I do not know which ones. I worked there at Record Town in the 90's. Oh my God...I had forgotten about the "Little Theater". I think the kiosk where I got my ears pierced was on the other side of that candy counter.